So I’m definitely in alpha stage with the game engine. In the near future, I will have a beta test with a select group of people. I haven’t decided yet on who; feel free to post on this thread if you are interested! Bear in mind though that being in a beta test means actual testing work, not just playing the game. I would expect bug reports and lots of constant feedback. If you’d rather just wait for the official release to enjoy the game, there’s nothing wrong with that. Today, I had the unique pleasure of fixing a bug and then seeing several features I hadn’t tested yet work perfectly! 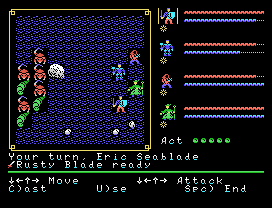 This particular combat, I can see my multiple monster generation system worked like a charm! The rats poisoned occasionally on melee attacks, and the monster AI was fairly good too. I still have several combat bugs to fix. The fighter, for example, should not be able to cast spells… In fact, the whole spell system has to be fully tested. I may have to write another side-tool engine to test the FX effects as well. I noticed while debugging the trap ones that there’s a LOT of “artistic adjustment” to make them look just right, and the best place to do that is in a separate tool so I can just cycle through FX and fine-tune them. This entry was posted in Assembly, Coding, CRPG, Design, Screenshots, TI-99/4a. Bookmark the permalink. Nice to see it in action!